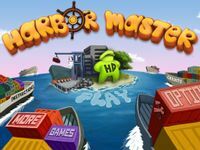 Harbor Master is a highly-addictive puzzle/simulation game where you have to control a harbor. Your job is conduct the boats to the right docks (depending on the color of the cargo), unload it and then sail away again, avoiding them to crash on each other. There are different size/speed boats (smaller are faster), with mixed cargos (so you have to unload it in different docks), and some other twists that make the game even more challenging.